I’m Gary, and my wife Maria has been with me every step of the way supporting my PTSD. I was in the army for 17 years, completing five tours of Northern Ireland with the Royal Green Jackets. When I was on operations, my brain was constantly on alert – totally switched on. On patrol, you think: “could it be me today?” There’s no way to switch off. When I met Maria I was working as a colour sergeant, but I left the army after realising it was best for our family, and instead became a singer. However, I wasn’t used to ‘civvy street’ and found it difficult adjusting. I had nightmares and I would lose my temper and throw things. I would never hurt Maria, but my drinking got out of control. 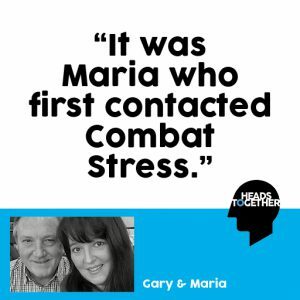 It was Maria who first contacted Combat Stress. At first I didn’t understand – there wasn’t anything wrong with me. I only went because Maria asked me to. I was diagnosed with PTSD. It all made sense. On my first tour, I’d survived an IRA ambush but rather than dealing with it, I’d buried everything, not wanting to show weakness to the troops. It hasn’t been all plain sailing, but I’ve learnt to take control and adapt my life. Maria completely understands. We live pretty much by a timetable; it works for me as an Army man, a great way of dealing with my outbursts. Maria has everything sorted – what time we’re getting ready, when we’re going out. Now I’ve got a different outlook. I’m much calmer and it’s all down to Maria. I couldn’t have done it without her. Gary was supported by Combat Stress the UK’s leading veterans’ mental health charity. They treat a range of mental health conditions including PTSD, depression and anxiety free of charge for veterans. Visit the website for more information.